New & Improved V2.0 Version, new for 2016! Tested and complies with Grill Impact Standard in BS7928:2013. Curved Frontal Design deflects ball on impact. Wide, Unhindered Front and Peripheral Vision. Iodised to prevent oxidisation and abrasion. Extra Chin & Throat Protection for all possible ball deflections. Adjustable Elastic Straps - ensures a snug fit. Can be worn with your cap and glasses. The new and improved (V2.0 Version) Aero P2 KPR Wicket Keeping Face Protector is designed specifically for wicket keepers who wish to perform at their very best. 'Keeping' in a batting helmet was the only option available until now. But a batsman's helmet is heavy and hot, with the back of the head completely enclosed with unnecessary protection. The vision and protective needs of a batsman are vastly different to those of a wicket keeper. 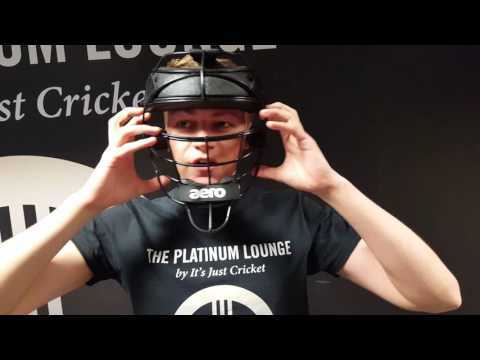 The Aero P2 KPR Face Protector is 60% lighter than a batting helmet and provides a far superior option for all wicket keepers. MOVE BETTER, SEE BETTER, KEEP BETTER!